Charlie Tilson is a Florida State League All-Star. He is the 12th-best prospect in the St. Louis organization according to Baseball America. He has been tabbed as the fastest baserunner in the Cardinals system. He is one of the leaders of the Palm Beach Cardinals. And Charlie Tilson is only 21 years old. The Palm Beach center fielder has had a tremendous first half to the 2014 campaign. He ranks near the top on the team in nearly every offensive and defensive category and by the All-Star Break, was batting .298 (70-for-235) with 32 runs scored, 17 RBI and two home runs. His striking numbers warranted a selection to the FSL All-Star squad - Tilson's first such honor in his young career. "It means a lot obviously," Tilson said on making the team. "That's what you prepare for all offseason. To be able to get out there and put up some good numbers in the first half and get an opportunity like that is a big honor." Tilson attributes the All-Star nod to the extra work he's put in with hitting coach Roger LaFrancois and Palm Beach manager Dann Bilardello. "I think it says a lot about our coaches," said Tilson. "I've been working out with Roger every day and he's been very helpful - Dann as well. I'm really excited about it." 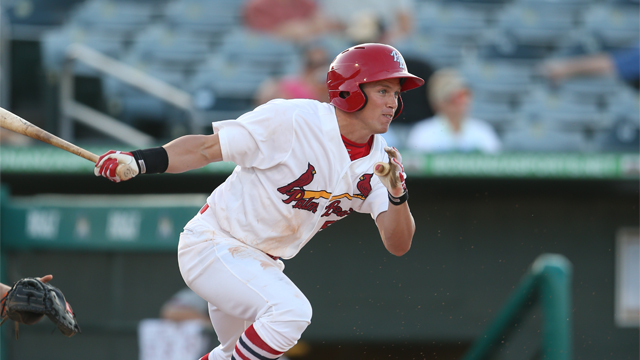 Tilson, who was drafted by the Cardinals in the second round of the June, 2011 First-Year Player Draft out of New Trier High School in Illinois, has come a long way in just two years of professional ball. He can definitely relate to the young high school standouts that were selected by St. Louis two weeks ago in the 2014 Draft. "It was an exciting time," Tilson recalls of the experience in 2011. "I was sitting around with my family. The draft is one of those things where you really never know what could happen. You don't know the outcome so I kind of tried to keep the group I was watching with small. I didn't want to have my expectations too high." While the wait wasn't too long for the highly-touted high school prospect, Tilson was happy when his name was finally called. "I definitely couldn't have been more fortunate with the organization I was picked in. It was a great honor, it was an exciting time, and I've been enjoying it ever since." For a player who has had a successful transition into professional baseball, Tilson notes that it takes a lot to make the conversion from high school star to an everyday ball player in the minor leagues. "I think there are a lot of factors for me," Tilson said. "You know, just being away from home for as long as we are is a big step out of high school. As far as the competition and the grind of it all, I think when you're playing every day - we play 140 games in a season - the most important thing I've learned is just to try and stay even-keeled. "Baseball's a game where you're going to have a lot of ups and downs so I think just having that confidence about you and maintaining composure through the season has been really helpful for me." As soon as this season or next, Tilson and the recent high school grads coming into the St. Louis organization could be teammates at one level or another. In the meantime, Tilson is already turning his attention to the second half of the season. "I started to get more comfortable at the plate in the first half," Tilson said. "First starting off [in the FSL] it was an adjustment. The league's a step-up for sure. I think the pitching we face is a little bit better. "I think if I can build on that and keep improving at the plate it should be a good second half for me." Whether it is in Palm Beach or Double-A Springfield, Tilson will help his team win in the final 70 games of the season. With a league-best eight game winning streak near the end of the first half, Palm Beach could certainly use the hot bat and blistering speed on the base paths to make a postseason run. But is Tilson really the fastest baserunner in the entire St. Louis system? "I definitely pride myself on my hustle," Tilson said with a smile. "We have a lot of fast runners in this organization - the competition is always high and we have fun with it. It keeps us all moving." A humble response for a high-character athlete. Other than stealing bases for a hobby, Tilson has also been extremely active in off-field charity work this year. Last month, the Cardinals prospect spent a morning at Palm Beach Children's Hospital along with some of his teammates. Tilson is also leading the charge in the Vs. Cancer Foundation Night at Roger Dean Stadium on June 17, raising thousands of dollars to help childhood cancer research and benefit the Palm Beach Children's Hospital. The whole team got behind Tilson and teammate Joe Cuda to shatter the team goal of $5,000 raised for the cause. Following the game on the 17th, Tilson, Cuda, and several more Cardinals will shave their heads on the dugout to show their support. "I thought it was a great idea," Tilson said of the fundraiser. "I think it's good as far as team camaraderie and I was excited to see everyone jump on board with that. My mom actually just beat breast cancer this offseason so it was good timing for me." With a remarkable amount of talent and a great head on his shoulders, Tilson has become a fan favorite around Jupiter, Florida. Be sure to keep an eye on for this future star. In the blink of an eye, he could be sprinting up the ranks in the Cardinals' system.